After an ambitious monument went bust, big heads remain. In what future civilizations may interpret as some kind of Stonehenge, in the distant farmland of Croaker, Virginia, there is a field filled with 43 giant heads of U.S. presidents. 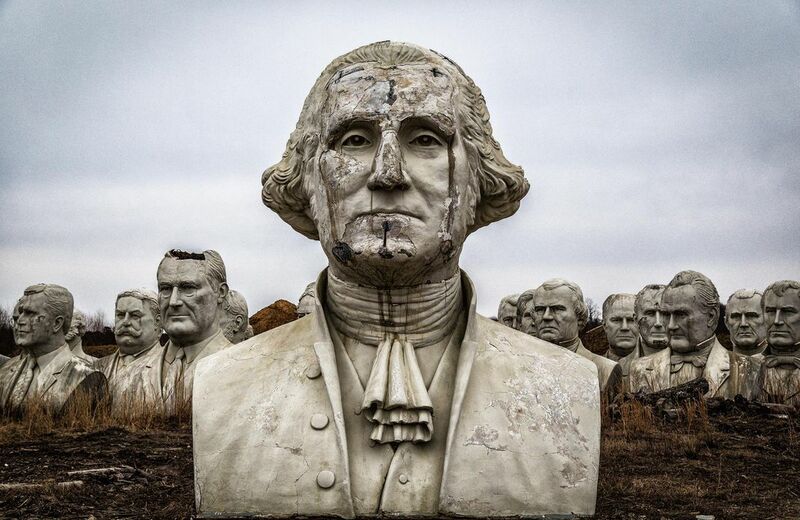 The heads are all that remain of Virginia's Presidents Park. First opened in nearby Williamsburg in 2004, Virginia's Presidents Park was a joint venture by local property owner Everette "Haley" Newman and Houston sculptor David Adickes. Adickes was inspired to create the heads after seeing Mount Rushmore. However, Presidents Park was a short-lived operation. The park cost $10 million to build, and, partially due to its hard-to-reach location, quickly went out of business for lack of visitors by the time 2010 hit. “Presidents Park was surrounded in controversy for over three years," says an urban explorer known as Abandoned Southeast who discovered the field one day and decided to learn its history. "Many thought it would take tourists away from Colonial Williamsburg, Yorktown, and Jamestown ... Several Williamsburg city officials spoke out calling the attraction tacky and a sideshow," he explains. And the 43 giant president heads created for the park? Well, basically nobody knew what to do with them. At the park's foreclosure, Newman told her co-investor H.B. Hankins, a Newport News-based contractor, to destroy the heads -- but Hankins didn't want to. Instead, he had the 43 11,000- to 20,000-pound heads painstakingly lifted by crane to a nearby private field he now owns, where, crumbling and crammed into three crowded lines, they remain. The destination is not an official tourist site and tends to confuse and mind-boggle visitors passing through the region who suddenly see an extremely unofficial-looking field, for inexplicable reasons, crammed with 43 giant heads. “People are surprised that these giant heads even exist,” says Abandoned Southeast in an interview. A large number of Virginia residents, including those living less than 30 minutes from the site, would agree -- they've never heard of it. The crumbling face of an 18-foot-tall George W. Bush looks down on us. And sighs. Have you ever seen this abandoned field in Virginia? Let us know in the comments. The grave of Stonewall Jackson's arm is buried about 115 miles away from the rest of his body. Read all about it here!